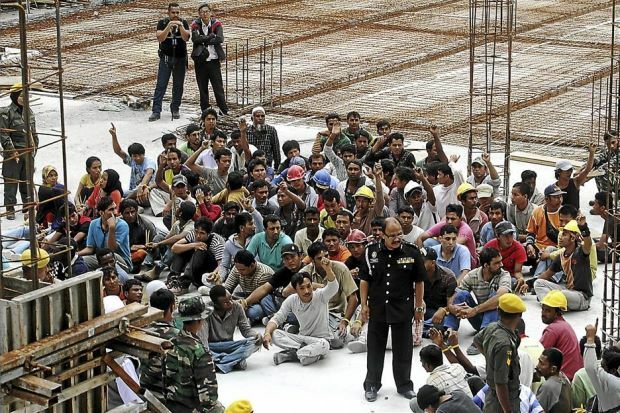 7 million foreign workers is about 23% of Malaysia population. Do you believe Malaysia a developing country with USD 10,000 GDP per capita needs so many workers? The answer is NO. I reveal the true reason for you. Many local people especially blue collar workers suffer most from the uncontrolled influx of foreign workers. Indian is hit hardest than other races. Besides the huge levy and recruitment fees earned by UMNO crony companies, police is next beneficiary from the presence of illegal workers. The market price is each illegal worker has to pay RM30 protection money per month to corrupt police. I compute the money paid from 5 million illegal workers each year to police (and their big bosses in Putrajaya) is RM1.8 billion. Levy goes to government coffer. Monthly protection money collected from illegal workers is matter for UMNO politicians. BN government allows unlimited import of workers not due to the shortage of workers, but the black money for UMNO corrupt politicians. KUALA LUMPUR: The Malaysian Trades Union Congress (MTUC) today called on the government to freeze the recruitment of foreign workers for a period of two years to avoid dumping of foreign workers in the country. MTUC president Mohd Khalid Atan said this was because the influx of foreign workers would have an impact on Malaysian society, not only in terms of economy, but also in terms of social problems. “Malaysia has an estimated seven million foreign workers, but only 2.2 million are hired legally. This is an alarming figure and by increasing the recruitment of foreign workers, the government will neither be able to control nor monitor the overall situation,” he told Bernama today. He said if not controlled, the foreign workers would also become the cause of concern for the safety and economy of local communities. Moreover, the presence of too many foreign workers, especially those who were unregistered, could also lead to the spread of infectious diseases, in addition to an increase in the crime rate relating to foreign workers. Mohd Khalid said there were also employers who purposely took advantage by sacking their local workers and hiring foreigners in order to reduce their operational cost. He said the government was not supposed to heed the demand of Malaysian employers who claimed that Malaysia was experiencing shortage of labour and the number of foreign workers need to be increased. Instead, he said the government should reconsider the decision to increase the intake of foreign workers to ensure that their number was reduced and that the safety of the local communities would be assured.